This is a first-hand account of alcoholism and its hopelessness as seen through the eyes of Eugene Standingbear. Gene quit drinking a decade or so before I met him in the mid-1970s. He referred to himself and his friends in the 1950s as “drunks” and “winos,” so the article below contains those terms, which some people might find offensive. “You take the first drink, and the second drink takes itself”…. At the end of the article below we’ll explore some facts and speculations behind the disease of alcoholism. Meanwhile, here’s Gene’s story. Whiskey and half-pay. Luther recalled his first speech on sobriety. Eugene’s father was like most of the revered Lakota leaders of the past two centuries: He avoided alcohol altogether, with a clear understanding that alcohol undermines nobility… especially among alcoholics. Eugene, on the other hand, enjoyed the warming effects of alcohol most of his life. In 1948 Eugene was commercial fishing in the Pacific Northwest with his 26-foot “pocket trawler” and was enjoying his second marriage to Velma Sparks. One summer evening, while coming in from a three-week fishing adventure, he radioed ship-to-shore to let Velma know he’d be home in an hour. There was no reply… and that was a cause for concern. The second world war was over now, Velma’s government job had been terminated, and so she spent all of her time either at home or at their restaurant out by the country club. She always answered the radio. Once ashore, Eugene called the hospital and police station, but there was no word on his wife. On a hunch, he drove by their rental properties until he saw Velma’s car parked in the driveway of their new tenant… a good-looking single man. Eugene burst through the front door to find his wife practically living there. Startled, the bachelor burned his finger on the stove where he was frying potatoes. Velma jumped up from the kitchen table in her bathrobe and stood frozen… in a state of shock. Eugene was a typical salmon fisherman “fresh” off the water—wind-burned, scruffy, stinking of sweat, and armed with a razor-sharp fishing knife on his belt. The man laid the pan on a cold burner and backed off as Eugene began to approach like a stalking wolf. Velma fell back into her chair and sobbed. Fearing the worst, she hunched over, squeezed her eyes shut, and clenched her fists tightly over her face. The fellow stood frozen in place but gave a small nod. Still clutching his knife, Eugene repeated, “You two get married. If you don’t, I’m going to kill you both.” He stormed out of the house and never turned back. 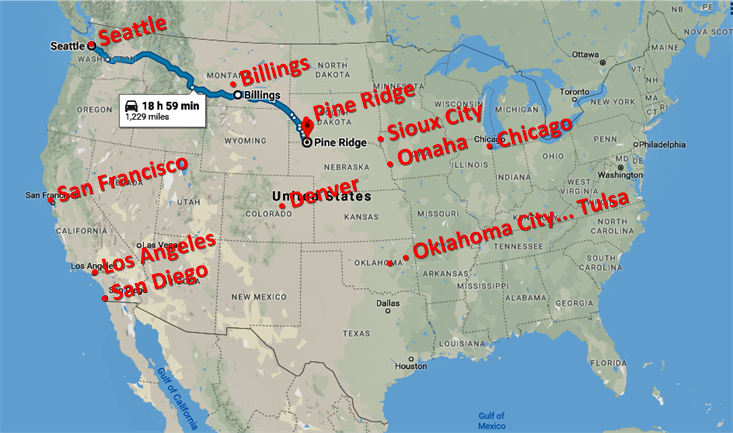 Within a week he left the west coast and drove due east to Billings, Montana, where he found work building oil refineries until the severe winter the following year made work impossible. Gene didn’t tell me (and I didn’t think to ask at the time) whether he sold his boat and brought along some of the wealth from his marriage, but my old notes suggest that he simply took off… leaving Velma with the entire estate, to which she was more attached than he was. Over the years his drinking had steadily increased, and now, with the break-up of his second marriage, alcohol became the center of his life. Feeling hopeless and depressed, he drove through a blizzard to Pine Ridge, where his mother and nieces met him with an air of disapproval. He was drinking too much and spending too much time away from the reservation… swaying too far from tradition. After several weeks on the reservation struggling through shakes, dementia, nightmares, and sleepless nights, he hopped on a bus to Denver, spent a few days homeless and freezing, then caught another bus to California. Soon he found himself moving through a dark, seedy netherworld of American inner cities—San Francisco, Los Angeles, San Diego, Tulsa, Omaha, Chicago, Denver, Sioux City, Seattle, Oklahoma City… hopping freight trains in the middle of the night heading north, south, east or west. Sometimes he found himself trudging across endless miles of prairie in Montana or Wyoming. He might walk all day without seeing a car. The only hints of civilization were the road and maybe a lonely windmill peeking over the horizon 40 miles away. The only thought running through his fevered head was, If I can make it that far I can get a drink of water. What little cash he had in hand he spent on wine, always trying to keep warm… or numb… or both. He scratched out a meager living in bars sketching portraits and playing honky-tonk piano, but relying on the generosity of fellow drunks didn’t provide a very steady income. Whenever he was broke, he found his way to the nearest Catholic Church, where he was always welcomed. Sometimes he stayed at the church a day or two, sweeping, scrubbing, and making repairs, until he earned a few dollars. Then he bought a bottle of wine and climbed onto the next boxcar. Unconditional love from Christians was among the forces that would keep Eugene alive during the next two decades on Skid Row. Another was his own natural charm, which continued to glimmer through the mists of his alcoholism. Other forces included his scrappiness and his sturdy Lakota metabolism. Accelerating down the road to nowhere with two good marriages in the rear-view mirror, he found one last chance at marital bliss when he got to Los Angeles around 1950. Stevie White Flower was a pretty, young musician and dancer who played accordion in Palm Springs resorts and dabbled in the film industry. She met Eugene in Hollywood shortly after her first alcoholic husband killed himself. Eugene and Stevie fell for each other and soon got married… twice. Their first wedding was a traditional Lakota ceremony performed on a TV program that spotlighted weddings from around the world. Gene didn’t recall the name of the TV show in the early 1950s, but it was probably NBC’s Bride and Groom, one of the first “reality shows” to be a big hit on American television. It was standard practice in those early years for TV production companies to purge their archives every year, so I can’t find a record of Eugene and Stevie’s televised wedding. You can find old Bride and Groom videos of other couples posted on youtube from their family archives, to get an idea. Anyway, Gene implied to me that during his episode of the TV show he led Stevie (and the camera crew) through a brief Lakota courtship ritual, playing a love melody on a cedar flute before the couple huddled together with a broadcloth blanket over their heads like two young lovers sharing their intimate feelings for the first time. When Eugene and Stevie’s televised wedding ceremony ended, the couple rushed to a justice of the peace to tie the official knot. Their marriage would last two years and involve heavy drinking. 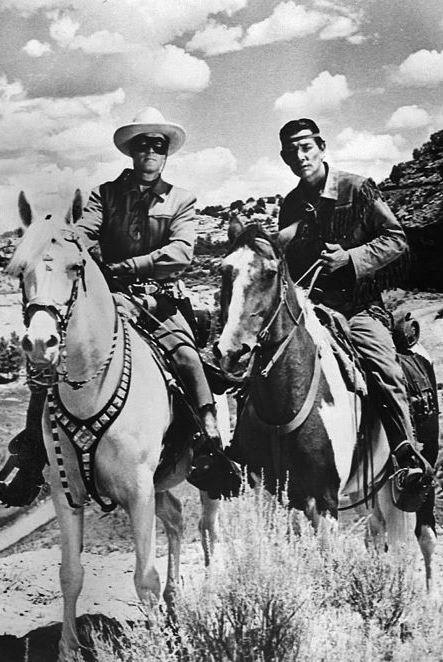 The Lone Ranger and Tonto (Jay Silverheels). They spent some time touring with an all-Indian song-and-dance troupe that featured Tessie Mobley, a Chickasaw operatic soprano, and Jay Silverheels, a Canadian Mohawk who (according to Eugene) was a skilled tap dancer known for his iconic dance shoes with silver-plated heels. But dancing was apparently just a small sideline for Jay Silverheels, who had been playing small parts in movies since the 1930s and had recently landed a promising role as Tonto, sidekick of The Lone Ranger, which was becoming a huge hit among kids (like me) on Saturday mornings in the 1950s. After getting divorced from Stevie, romance didn’t work out so well for Eugene. Neoma was a striking redhead in Tulsa with a speech impediment, a chip on her shoulder, double-D dreams of riches, but no skills or strategies to get there. When she saw Eugene sketching on the sidewalk, she stopped to chat. Here was a handsome Indian who also seemed to be going through hard times. He regaled her with stories of his colorful life (he’d always been a great storyteller), and when he talked about his rich adventures while living on the nearby Osage reservation, her eyes lit up. Neoma suggested they have a drink together, and Eugene happily accepted. Accompanying a beautiful redhead to her apartment in Tulsa was about the last thing he recalled of his relationship with Neoma… until a few days later when he woke up in a motel room in Independence, Missouri. “Who’re you?” he said, groggy and dry. Neoma guffawed, “I’m you’re wife, you thumbitch.” She’d driven Eugene to Independence the previous day, and they’d had a quickie wedding that Eugene could now barely recall. But as Eugene’s mind began to clear, he explained that he wasn’t the rich Osage Indian Neoma had assumed, but instead was a Lakota, homeless and penniless. The marriage instantly dissolved. Irene was a nice, wealthy widow in Hawthorne, California, who bought wine by the gallon. Eugene couldn’t believe his luck! An attractive older woman and perfect companion… or so he thought. When the newlyweds returned to Hawthorne, Eugene learned the secret that Irene had been keeping: Excessive alcohol consumption had badly dehydrated her, stressing and weakening her kidneys. In the middle of the night, Eugene awakened to find the bedsheets soaked, warm, and wreaking. He jumped out of bed, pulled on his clothes, hurried out the door, and never returned. It was at Fifth and Main Street in Los Angeles where Eugene realized he’d finally made it to Skid Row… literally. His first wino friend was a California Mission Indian who called himself Crazy Horse, after the famous Lakota warrior who’d put up a brave, last stand against the US cavalry 75 years earlier. This new, 20th Century Crazy Horse liked being in Lakota company and quickly latched onto Eugene, determined to teach him how to survive in this grave, new world. As it turned out, Eugene had just as much to teach Crazy Horse, who had been a barber before falling into alcoholism. Half the time he owned an expensive set of hand-engraved, gold-plated barber tools. The rest of the time they were sitting in a pawn shop so that Crazy Horse had enough money to buy wine. They got lots of offers early in the day, since haircut costs were quickly rising in the States and had reached 75 cents to $1 in LA. Crazy Horse kept busy for a few hours until he had 3 or 4 dollars in his pocket. Then he slipped Eugene a dollar bill and said in a business-like voice, “You better go make a run.” Eugene found his way to the nearest liquor store and bought a jug of cheap Tokay—a sweet, white, dessert wine. As the day wore on, the two entrepreneurs drank more and more wine and found fewer and fewer customers. Most people just shook their heads or rolled their eyes before quietly closing the door in their face. No problem. By evening they had $10, enough for a room in a flophouse and two more jugs of wine, with a few dollars left over for morning. All night they dozed, awakened, sipped wine, and dozed some more. A bed in a flophouse cost 35 cents or 50 cents a night. It was a large room full of cots covered with quilts or blankets that were heavy and torn. Rooms were shared by dozens of winos, many of them Native Americans, along with cockroaches, flies, spiders, and lice. In the 50-cent flophouse, an extra quarter would get you clean sheets. Each flophouse had a caretaker, but fights often broke out and no one would try to stop them. Even if someone was killed (not that uncommon), no one was ever arrested, and no one would rat out the killer since rats died quickly in a flophouse. By morning the wine bottles were nearly empty, so Eugene and Crazy Horse bought some more as soon as the stores opened. By late afternoon they’d run out of money and wine but were in no condition to resume their hair-cutting business… so they hocked the barber tools for a good, long drunk. Wine, nothing but cheap wine. If you held three pictures in front of a wino—1) an expensive bottle of fine whiskey, 2) a young, nubile, naked woman, and 3) a bottle of cheap wine—his eye would always be drawn to the cheap wine. Wine gave him a warm glow and provided enough nutrients to keep him alive for a week or two without food. After three days of dingy bars, flophouses, and wine, Eugene and Crazy Horse ran out of money again. All they owned were the Salvation Army clothes on their backs and one jug of wine. “Where d’you wanna’ sleep tonight?” said Crazy Horse. Eugene had no idea and shrugged. Downtown LA and MacArthur Park in the 1950s. So Eugene trudged a couple of miles with his pal through the hot, crowded, downtown streets of Los Angeles, a couple of invisible derelicts, to discover a veritable paradise the likes of which his ancestors could only have dreamed. As the sun set, the moonlight made the rich foliage of MacArthur Park seem to melt into the emerald lawn. Crazy Horse led the way to his favorite spot in the park, where they burrowed into a hollow cavern in the cool, green jungle… and passed the bottle. Police cruisers passed by all night on their rounds, flashing their spotlights through the park in search of lovers and vagrants and muggers, but Eugene and Crazy Horse were cloaked and invisible in a forest thicket. They woke up in the morning groggy and dry, shaky and dehydrated. Beyond the trees they could hear the city coming alive. Car horns… the faraway blast of a jackhammer…. 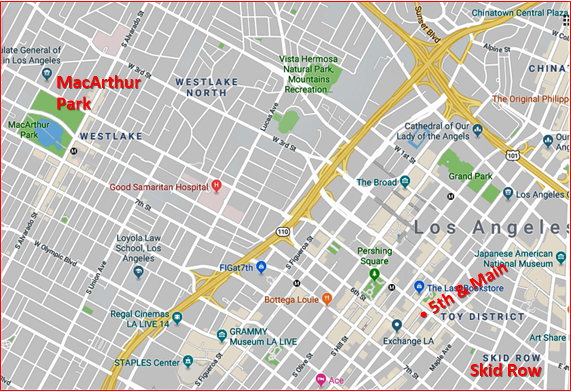 They were at the opposite end of the park from Wilshire Boulevard, and across the narrow street shop windows lit up as streetlights and storefront neon signs were snuffed out. The door of a drug store opened up, and the owner pushed a popcorn machine out onto the sidewalk. He filled the machine with seeds and retreated into the shop while they started to pop. So Eugene shrugged, pushed his way across the street, and started hustling the growing crowd of businessmen. A few minutes later he returned to the park. Eugene sat down heavily on a park bench, sick and shaky, while Crazy Horse crossed the street to the drug store, bought two bags of popcorn, and returned. “C’mon,” he muttered as he passed Eugene, who was getting nauseous at the sight and smell of popcorn. He climbed to his feet and caught up with his friend. They sat on a soft, grassy knoll near the shore between a bed of brilliant flowers and a thick tangle of shrubs. A flock of ducks and several geese were grooming themselves on the water. Crazy Horse handed a bag to Eugene and started tossing a few pieces of popcorn onto the shore. As Eugene watched the ducks and geese start paddling toward shore, sweat was starting to bead on his forehead and trickle down his face. What the…. Before long a big, green-headed, mallard drake was eating out of Eugene’s hand… and he grabbed it around the neck at the same time Crazy Horse grabbed another duck around its mouth and jumped to his feet. Eugene grabbed the bird with his left hand and slid his right hand up the neck and over the mouth. That stopped the quacks, but the big duck’s flapping wings popping and cracking against the lining of his Salvation Army jacket nearly knocked him over, he was so weak. With bulging, flapping jackets, the two guys hurried through the park, across the street, and down several alleyways until they came to the back door of a small Greek restaurant. Crazy Horse pounded on the door. The door opened just enough for the round, bald head of the Greek cook to pop out. His eyes lit up with recognition. The cook pulled two dollars from his pocket and handed them to Crazy Horse, who gave up his flapping duck. The cook grabbed it by the neck, stuffed under one arm, and reached out for Eugene’s bird. Eugene was too sick to argue and handed over the duck. A dollar got a bottle of wine with money left over. The following video, with clips from various communities, shows the despair of alcoholism… how happiness and achievement can be washed away by alcohol, resulting in regrets. “MacArthur Park,” written by Jimmy Webb and sung by Richard Harris, is (imho) one of the best songs ever made that tell of the glories and regrets of a lifetime. To me it’s a beautiful theme song for the ravages and lost dreams of alcoholism and the lives it can destroy… the loss of love. The video clips were downloaded from the Internet with an attempt to make the people (appropriately) anonymous. … but you can see a preview here. On chilly winter evenings, winos in Los Angeles were preoccupied by two things: a place to sleep and a “blanket,” or bottle of wine to be sipped all night for warmth. One night Eugene was with a friend who knew some good sleeping spots, but they were usually crowded. They entered an alley and found a sheet of corrugated metal leaning against the wall. Pulling the metal aside, they crawled through a hole in the wall into a narrow tunnel about 4 feet square. A number of men had already moved into the narrow tunnel for the night and had to crowd together more tightly to make room. Before long more people showed up, and the queue got tighter and tighter. The only exit was blocked now… which worried Eugene. Steam pipes ran through the tunnel, keeping it so warm that some of the men had removed their shirts. Eugene heard an occasional glig-lig-lig-lig-lig as buddies passed their bottles back and forth and drank a few swallows. The floor was covered with old newspapers, and the air wreaked of cigarette smoke and urine. The cave flashed brightly every so often as nearly all of the winos were lighting cigarettes, smoking and tossing their matches and butts carelessly onto the paper. It occurred to Eugene that if there were a fire, only a couple of guys would make it out alive. Eugene and his buddy passed the blanket all night, and fortunately there was no fire. On another night Eugene and two other winos made their way to a vacant lot in Hollywood that had been graded flat to become a parking lot. A pump house had been removed, leaving a pit about five feet deep and wide enough for a half-dozen men to sit. They lifted the flimsy cover of cleated boards and climbed down into the pit. It was pitch black. They realized that the place was already over-crowded with eight or nine men, and everyone was suddenly irritable. Grunts grew into shouts and shoving, then fists started flying in the dark. Within 15 minutes Eugene and his two friends had run everyone else out of the pit. Over the months in LA, Eugene had overheard the name Pasadena being mentioned by several winos with an air of reverence… as though that city was some sort of paradise. So one summer morning he hopped on a train heading north that would be passing through Pasadena a short 10 miles away. Within an hour he jumped off a boxcar and made his way to downtown Pasadena. Like a thirsty horse finding its way to water, a wino could “smell” skid row for miles. He entered a pool hall, looked around, and the man at the desk nodded toward the back. Eugene walked out the back door into the alley. Two long rows of sturdy benches lined the alley, one row on each side, tucked up against the buildings. Most of the benches were occupied by winos, some dozing, others talking idly. As he stepped into the alley, everyone fell silent and blank faces turned to size him up. Eugene glanced at the fellow and didn’t sense any trouble. “Nope, first time in.” As he sat beside the old-timer, other guys lying on the benches woke up, rubbed their eyes, and sat up. Here was a newcomer… first time in Pasadena. Good. There was an understanding between the city and its vagrants: If the vagrants stayed in their designated areas, like this small block with its maintained alleyway, they wouldn’t get hassled by the Pasadena police. If vagrants were found straying in the city they’d be arrested. Eugene climbed to his feet and set off on his mission to circle the block… getting a job ticket and then a suitcase packed with good clothes, then hocking the clothes. He talked the pawn shop owner up from $3 to $5.25. Finally he got to the liquor store and emerged with two armloads of cheap wine. He rounded the corner and re-entered the alley to a hearty cheer, a round of applause, and laughter from all the guys on the benches. He’d made it home. These were his people now. Best skid row in the world back in the 50s, Pasadena in the summertime. In the evenings, winos climbed up the fire-escape ladders to the roof with a jug or two, took off their shirts, and slept in the gentle ocean breeze, sipping wine and dozing. Not a care in the world. Heaven on Earth. So Eugene and two other winos wound their way through alleys and side streets to the church. Eugene was really sick by this time. He hadn’t eaten solid food for more than a week and for the past couple of days had nothing but wine… a 24/7 sipping experience. Arriving at the front door of the church, one of the winos grabbed Eugene’s arm and guided him off to the side of the door while the other guy rapped solidly three times. In a few moments the door opened about 10 inches to the end of the security chain. A young priest peeked out, glanced at the vagrant, and handed him a quarter. And the door closed. A few minutes later the second wino knocked, and an older priest looked out, extending a fist that opened to reveal another quarter. And the door closed. The two winos looked at Eugene. Your turn. Weak and shaky, Eugene sighed and knocked on the door. As the young priest peeked out again. Eugene noticed him shaking his head while extending his arm. Eugene carefully took a quarter from the soft hand. The three winos made their way back to their alley, bought a 65-cent jug of wine, got settled on a bench, and began passing the bottle back and forth. Within minutes, Eugene was suddenly overcome by the most wrenching stomach cramps he’d ever experienced. He thought he was going to explode. Somehow he climbed to his feet. Doubled over in pain and clasping his stomach with both hands, he stumbled out of the alley toward a medical clinic a few blocks away. He made it to the front steps and passed out. A nurse apparently found him. He heard someone tell her to give him some shots and to call an ambulance, and he passed out again. Eugene awakened on a canvas stretcher being carried to an old army-style ambulance that had slots for six stretchers, three on a side. When Eugene’s stretcher was mounted in the bottom slot on the passenger side, he noticed that the other five slots were already filled with motionless winos. As the ambulance pulled away from the curb and the siren started to wail, Eugene lost consciousness. Still no response, so Eugene kept punching, each punch getting slower and weaker until he ran out of energy… and once again he thought he was going to die. Finally the ambulance arrived at the hospital. One by one the stretchers were unloaded by medics, who checked each vagrant’s pulse before transferring him a cot. He gratefully watched them unload the stretcher above him. A medic checked the huge man’s pulse and threw a sheet over his head. “D.O.A.” he muttered and came to grab Eugene’s stretcher. Eugene declined. He’d been to cure farms before. He’d been fed paregoric and laxatives until his digestive system contracted violently and it felt like all of his insides were liquefied and coming out both ends. He’d watched patients go into convulsions for hours and then die. With bodies accustomed to wine and allergic to solid food, winos were usually fed intravenously. The general consensus among winos was that a lucky few people had hit rock bottom by the time they went to rehab, and they got into some kind of recovery program afterwards. They were able to give up alcohol completely. But for most, a 30-day cleanse was just a springboard to an explosive, sometimes fatal drunk once they got back out on the street. Eugene wasn’t ready for another cleanse. Sickness became a way of life. Cold nights were spent, usually alone, in culverts, under loading docks, or in boxcars en route to the next city. Stomach cramps, diarrhea, and regrets often kept Eugene edgy and sleepless for several days in a row. A small scratch anywhere on his body would quickly become an ulcerous sore. It would have taken two or three months of regular eating to purge the body of impurities… but that was the last thing on a wino’s mind. Eugene and his pals would sometimes give blood three or four times a month to earn enough money for several jugs of wine. Some winos left the blood banks with tags on their toes. A wino only had a vague awareness of the world around him as he stumbled numbly across a busy street… passing out on a driveway or lawn, or in an alley or gutter. Whenever Eugene ran out of money and wine, reality crept painfully back. He woke up in Omaha one morning sick and shaky. He’d been drinking for two days, and now he was broke. He walked unsteadily to an employment agency, where he found a job washing dishes at a nice restaurant four blocks away. Throughout the morning he scrubbed pots and pans by reflex, vaguely aware of the activity in the kitchen. At noon, when he took a bite of a sandwich, his stomach twisted in a knot, so he set the food down and returned to the sink. Throughout the afternoon, painful, haunting memories flashed through his mind. Omaha… Circle of Dancers… a sense of honor and pride… Big John… Mother…. Beads of sweat trickeld down his face. The Colonial House… Bremerton… Velma…. Hopelessness set in. His wife Mary… his son George… his father, Luther Standing Bear… his in-laws Fred and Julia Lookout…. Eugene fell back from the sink and nearly collapsed, but found enough support against a wall to lean unsteadily for a few moments. Several kitchen workers nearby glanced up from their jobs, shook their heads, and went back to work. Eugene’s face was contorted with pain as he pushed himself to his feet, slowly went back to the sink, and continued washing pot and pans. By late afternoon his mind was in turmoil. During his last trip to Pine Ridge his mother had made it clear that he was no longer welcome at home; he was drinking too much and had strayed too far from his heritage. Everyone knew he was a drunk. He was part of Skid Row. He could die and no one would know. Nor care. His body was weak, his hands were shaking, and on the inside he seemed ready to explode. On the outside he looked just like any other wino. At quitting time he asked the manager if he could be paid, explaining that he needed money for a room and a pack of cigarettes. Eugene had been on Skid Row nearly two years now. He couldn’t get to sleep without knocking himself out with wine. Leaving the restaurant he bought a jug of wine and a dollar room at a flophouse. He sat on the bed and guzzled most of the jug before he began to feel tired, so he settled back on the bed and closed his eyes. Suddenly his head began to reel violently, his stomach twisted in a knot, and he jolted up into a sitting position. Grasping the bedposts at the foot of the bed, he sat staring at the wall for many long minutes. Again he tried to lie down, but stomach cramps made him bolt upright. So he sat at the foot of the bed all night, dead tired, but unable to sleep… sipping wine and smoking cigarettes. A few years later he was in a boxcar heading east, and he hopped off in Denver in the dead of winter… big mistake. Winter wasn’t a great time to be in Colorado without a roof over your head. Then again, no better time and place for survival training. Eugene was all alone on Larimer Street when he came across a tall, lanky man calling himself Stretch, who was also alone. Eugene was freezing, penniless, and wearing a light Salvation Army coat, while Stretch was wearing a thick overcoat. Stretch asked the shivering Indian if he had a place to sleep. “Nope,” Eugene shook his head, his teeth chattering. Stretch said he had a blanket (wine jug) and a good place with a small fire, so Eugene followed him to the rail yard, where they entered a culvert below the tracks. Stretch had stacked an armload of boards and sticks at the end of the culvert for firewood. Eugene was impressed by the guy’s resourcefulness. Stretch opened a full jug of wine, took a sip, and passed it to Eugene, who managed to take three good swallows with his shaking hands before passing the jug back to Stretch. Before long Stretch had a small fire going, and the jug was about three-quarters gone. Though still chilled to the bone, Eugene was starting to feel a mild glow… and he got to thinking…. Here he was, freezing in a light jacket, and there was Stretch, nice and warm in a fur-lined overcoat. Here he was, shaking and miserable, and there was Stretch, all patronizing and pompous. Eugene picked a fight with the tall guy and started throwing punches. The two men rolled and tumbled across the frozen ground and through the fire, scattering red embers around the culvert. Both men kept their eye on the wine jug, still a quarter full, while they fought savagely. Breaking a wine jug was a cardinal sin among winos. Before long, Stretch went crawling quickly out of the culvert without his coat. Eugene now had the “blanket” and heavy overcoat, and he quickly pushed the fire back together. … that day at Pine Ridge when Frances was scarcely old enough to walk, but Uncle Eugene strapped her onto the back of an old work horse for a nice ride around the yard. Suddenly the animal bolted and took the young girl for a wild, bouncing ride through a half-mile of sage brush with her uncle chasing frantically in pursuit. When he finally caught up to the old, exhausted horse, little Frances was laughing. She’d loved the ride! … or the time Eugene listened to his teenage niece struggling to learn piano, hitting off-keys and grimacing… then years later watching proudly as the pretty, young woman played concert piano before a live audience. … then watching through the dark years as alcohol slowly took control of her mind and crippled her spirit. … and now she was dead. For the first time, Eugene’s life as a wino came into perspective. He suddenly realized his life had no meaning. In the past 10 years he’d slithered to the depths of American society inhabited by the sickest of the sick, where only the heartiest souls survived. He was “lower than a snake’s belly,” he’d reflect later in life. And with that realization, the walls of the pit collapsed. He felt the weight and smelled the stench of everything he’d seen, everything he’d done, everything he’d been during the past 10 years. His knees buckled, and he fell forward onto the casket… and he sobbed. Weak and convulsing, he embraced the casket. As he stumbled weakly and blindly onto the street, greeted by a chilly evening, things felt different. It was as if he were no longer in his body, but above himself, casually watching himself move through a dark and ugly world. He saw himself wearing a light Salvation Army jacket, weak and trembling. All he could think of was Frances… lovely little Frances… but all he could see was this wino in this wino’s world. He watched himself walking aimlessly for more than a mile. Everything was cold and dirty as darkness was settling over the city. The street light on the next block showed the silhouette of another man tightly clutching a bottle and staggering into the alley. Small neon signs flashed BAR and LIQUOR out into the dark world like beacons of despair. He saw himself pull a door open, clutch a jug of wine, and dig through his pockets for change. He saw himself emerge into the dark night, his shaking hands twisting off the cheap bottle cap, and raising the jug to his lips. It was soothing. His mind began to numb. There was no sense of time as he saw himself buy a second bottle. .. then wake up shivering in a dark alley… then trying in vain to stand up… then passing out… then awakening once again and struggling to his feet… then staggering and leaning against a brick wall, edging his way to the sidewalk. He watched himself stumbling several blocks and climbing desperately up a cement stairway to a police station. Artist rendition of Denver Municipal Judge William H. Burnett, and an excerpt from the ABA Journal, November 1962, page 1047. Somewhere in the recesses of his mind Eugene recalled that there was a progressive night court judge in Denver… a crusader for the rehabilitation of derelicts. The night court was held in the same building as the police headquarters. Eugene somehow knew that if he could find that judge, he’d have a chance at redemption… and it might be his last chance. 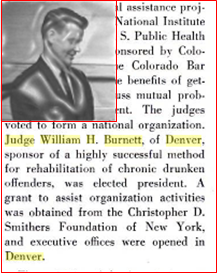 That night court judge was probably Denver Municipal Judge William H. Burnett, who had earned a national reputation as a leader in helping the homeless. Now Eugene was back in his body. He swayed in front of the desk sergeant and asked for help. “Take a seat, Chief, the judge is in court,” the sergeant said with a dismissive wave. Eugene’s lungs felt like they were on fire. His whole body was shaking. He stumbled to a bench and lay down on his back, his arm draped partially over his eyes to block the fluorescent glare, his mind reeling. He saw the shape of a man in blue uniform walking toward him, pulling a night stick from his belt. Passing the bench, the cop slapped the billy club on the sole of the wino’s shoe, and Eugene felt of jolt of searing pain flash through his leg. He heard the desk sergeant chuckle. Eugene pulled himself up to a sitting position, allowed enough time for the spinning in his head to subside, then limped unsteadily to the police chief’s office and stood in the doorway. The chief was busy with paperwork. He glanced up at the derelict, shook his head, and returned to his paperwork. Just another wino. Eugene fell into a chair inside the door and spoke to the chief, but he was ignored. Suddenly his stomach twisted with cramps and he doubled over in the chair. The chief glanced up again, sighed, and returned to his paperwork. Eugene struggled to his feet and stumbled out of the office, down the stairs, and into the men’s room. He leaned weakly on the sink and groped for the hot water faucet, but collapsed, unconscious, to the floor at the base of the urinals. Moments later he was awakened by the sound of laughter and the feeling of warm water spraying on his face. He raised his head to see two police officers standing above him. One was urinating on his head. As the officers left the room laughing, Eugene realized he was too weak to stand up. He crawled slowly out of the men’s room and up the stairs, then staggered to the bench in the hall, where he passed out. Before long he noticed some shouting far off in the distance, and he thought maybe there was a problem outside. He tried to wake up but couldn’t, and the distant shouting continued. The night court judge and the police chief were hovering over him, but their voices seemed far away. Eugene’s skin was purple as two officers carried him to a squad car, shoved him in the back seat, and drove him to the hospital… where he was diagnosed with double pneumonia and was clinging to life by a thread. Spirits. Though controversial, it’s believed by many (including me) that there are many spirits living near the Earth, meddling in human lives, including spirits of deceased alcoholics who get close to susceptible people on Earth and compel them to drink. (That’s one possible reason why alcohol was called “spirits” ages ago. In fact, the Koran [verse 37:47] refers to “al-ghawl” as a troubled spirit that makes people intoxicated… and that Arabic term is a possible source of the word “alcohol.”) If spirit influences are real (as I’m convinced they are), then one way to overcome alcoholism is to be part of a group (such as 12-step meetings or religious or social groups that commit to no drugs or alcohol, or rehab programs) because (again, people like me believe) many spirits are doing service work in order to free themselves of Earth’s bonds and to rise to finer realms… by making amends for their own bad lifetime choices that got them stuck after they died. One way for a spirit to redeem itself is to be present at sober gatherings here on Earth, unseen by the people, with the sole intention of protecting and supporting vulnerable individuals, and silently urging them not to drink. So when an alcoholic joins such a group, he’s also likely to get a team of invisible helpers and supporters working diligently behind the scenes to help him stay sober… to fend off the “al-ghawl.” The spirit helpers probably can’t be much help, though, unless the alcoholic takes the group seriously, works its program, and helps others. If there are any omniversal golden rules, this is certainly one of them: Get closer to the source by acknowledging the source and by helping others to get closer to the source. … Especially important, since many people in these groups are at a vulnerable stage in life while trying to recover… and where there are vulnerable people there are often predatory forces, on both sides of the veil, trying to take advantage of them on this noble-savage Earth. Those forces of darkness pull people away from the source. So… when European culture hit America, it was like the perfect storm for the Lakota people. Their population dropped quickly from about 28,000 (in 1600) to about 9,000 (in 1800), before slowly rebounding. Eugene Standing Bear, born in 1906, was probably a functioning alcoholic most of his life. … it seemed to me that there was a controlled anger lurking beneath Gene’s quiet surface. Gene described his life as though much of it was cloaked in a gray mist… and what made it all worthwhile, especially after age 40, was knowing he could have that next drink. His stories suggest that he was often one drink away from a good fight. By the time he was 50 he was hopelessly caught in nonfunctioning alcoholism… as his stories above indicate. To the best of my knowledge, Gene never attended (or at least was never welcomed into) an AA meeting, where he might have found real friendship and positive support had he been ready to work the program…. … but he did survive alcoholism, thanks no doubt to his powerful metabolism and bright spirit. He eventually hit rock bottom near the end of his life and found sobriety… and that’s the subject of the next and last installment of this series. Thank you Mark – a lengthy and rewarding story. We appreciate you sharing. It would seem you’ve been building for these articles for ages. We look forward to more. Yep, my book about Gene Standingbear was the first book I wrote, back in the 70s. Never published. Not well written. Only recently did I feel ready to rewrite it and give it the attention it deserves. It’s been a fun and grueling experience. What a life he lived!